Are you interested in getting a relaxing treatment by now? To book a mobile massage, just give me a call, send me an e-mail or use the contact form at the bottom of this page. I can not always answer phone calls right away – but I’ll call you back as soon as possible. At what times can you use my mobile massage service? I have no fixed opening hours, but I am available daily from Monday to Sunday. Usually I offer my first massages at 8am and my last massages around 8pm. On request, massages outside of these hours are also possible. In which areas can you get a mobile massage? I offer my mobile massages in Linz and surroundings for a fixed price. 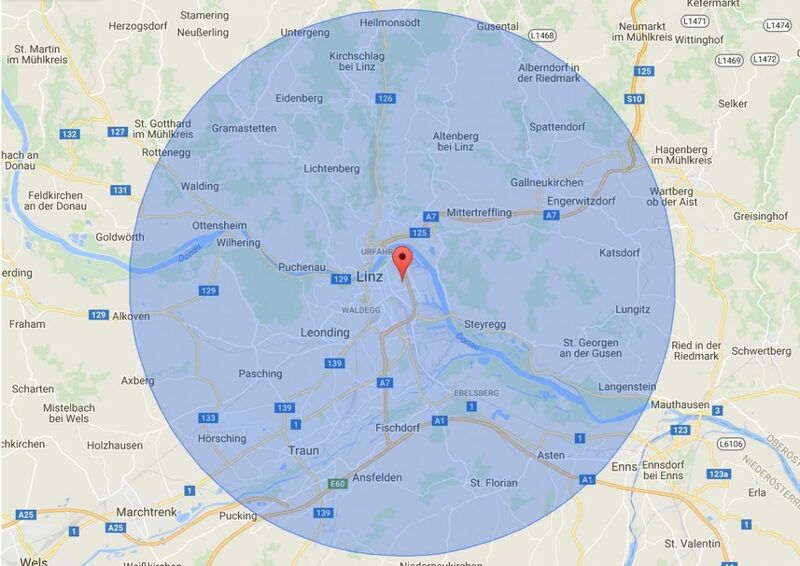 The radius shown on the map approximately indicates the area where you can get a Relax@Home treatment. Your home is slightly outside of the shown radius? A mobile massage might still be possible on request. On certain days I am also available in Vienna – if you are interested just get in contact with me. I've read the privacy agreement. I agree, that my provided contact details are stored permanently, so that Philipp Troger is able to respond to my inquiry and answer possible follow-up questions.